Whenever two or more people gather together, there is the distinct possibility that an association, club or network of some kind will emerge. This was certainly true in Newark. Even before the end of the Revolution, Newark's oldest club, St. John's Lodge, founded in 1761, entertained Gen. George Washington when he visited Newark and Morristown. The following examples are only a few of the many organizations created to fill the religious, social, political, educational, and cultural needs of Newarkers. You might remember that the rebuilding of the old Newark Academy was made possible with the help of St. John's Lodge, and in 1845 the New Jersey Historical Society was founded for the purpose of recording and storing the state's history.In 1854, the Newark Daily Advertiser reported the emergence of a local 'Y' movement to train young people to enter society, namely to help in 'the production of suitable homes, to introduce them to proper associations, to provide free lectures, and to create reading rooms and other means of moral and intellectual improvement.' On November 27, 1880, the first meeting for that purpose was held in Library Hall. The Prince Hall Grand Lodge F. & A.M., also known as Bethany Lodge, was established in 1876, making it one of the city's oldest African-American organizations. Hall, a black man from the West Indies, migrated to Boston where he became a successful businessman and champion of African-American economic and political rights. In 1784, he received a charter from the English Masons to establish a Masonic lodge in Boston. Soon afterward similar lodges appeared in Philadelphia and Rhode Island. By 1876, Newark had one, too. The Progress Club, founded in 1872, was located on West Park Street, one of the choicest locations in Newark. Its original name was the NNC, which stood for No Name Club. The club's four-story brownstone headquarters included a reception room, double parlors, a library, a dining room, and a ladies retiring room. A billiards room and banquet hall were available to members such as the Froelich, Lehman, Schlesinger, Barthman and Plaut families. The Essex Club occupied several sites on Park Place bordering Military Park. Founded in 1876, it was considered by many to be the granddaddy of all the 'old boys' organizations. Originally at 44 Park Place, its last home was at 52 Park Place, the building which is now being renovated as the new headquarters of the New Jersey Historical Society, which will open in 1997 as part of the downtown cultural complex. The year 1883 saw the birth of the Elks Club, and the North End Club came two years later. Both were large organizations with elaborate facilities. Besides caring for its members in posh surroundings, the Elks Club established a Newark facility for the deaf. In 1907, their club was located at 37 Green St. In 1926, they moved to a new 12-story home that became the Essex House on Lincoln Park. This was 'considered to be one of the most beautiful fraternal lodges and clubs in the country.' It was constructed of brick and stone and had 135 rentable rooms. The lodge and the club occupied the first five floors and included a swimming pool, large gym, handball court, and card rooms. The upper levels were used for dining rooms, a grill room, cocktail lounge, and a large library with bookcases reaching from floor to ceiling. The lodge room on the third floor was well appointed. Emblazoned in the ceiling in large gold letters were the words Charity, Justice, Brotherly Love and Fidelity. But the twin evils of the Great Depression and Prohibition took a heavy toll on local business rentals. Bankruptcy and foreclosure followed in 1931 with the loss of $2.5 million. At the other end of town, in Newark's Forest Hill section, William Ellison organized the North End Club at Third Avenue and Broad Street, in order to 'conserve and centralize the north Newark social life of the uptown community.' The older families organized the new club and built a substantial clubhouse to which prominent men of other parts of the city and county soon sought entrance.' The Forest Hill Literary Club was founded exactly a century ago by Dr. Frank Gaylord Gilman and friends who lived in north Newark. 'Monthly meetings and formal dress for those occasions were required.' Each literary club member had a commitment to give a talk, when requested, on a literary subject, and those talks were frequently followed by lively discussions.' At the 100th anniversary meeting, held this past June, the club had been considering disbanding. However, recent developments indicate that the 'Lit' may indeed take a new lease on life through a possible merger with a group of young Forest Hill homeowners who want to continue its long-established literary tradition. Three important clubs emerged in the first decade of the present century: The Newark Motor and Yacht Club in 1907, the Downtown Motor Club in 1913, and the Newark Athletic Club in 1919. The Motor Club started at Knoll's Boat House at the foot of Chester Avenue, and was 'the scene of rowing regattas and canoeing parties for many years. George Brown built a boathouse at the foot of Delevan Street in 1907, where members of local prominent families supported a variety of riverfront activities.' Following World War I, the recreational use of the river declined with the rise of local industry. By World War II, the Newark regattas had become pretty much a thing of the past. Still, as late as 1937, there were some 200 regular members of the old organization. The Downtown Club was formed in 1913 'for the social benefit of members and to provide a suitable meeting place in the old business center of the city.' The club opened its doors in the old Kinney Building at Broad and Market streets, moved to the National Newark and Essex Building in 1931, and finally established a permanent home at Bamberger's Department Store in 1955. Tables were always set for 300 'in a convivial atmosphere of oak paneling and brass grillwork with the smoke rising from good cigars. It was a place where the captains of Newark commerce, industry, and the legal community escaped in lunchtime pleasures.' The club's membership included such names as Doremus, Frelinghuysen, Goldsmith, Hedden, McCarter, Marsh, Sanford, Seymour, Shanley, Shipman, Vanderpool, Ward and Wright. Later additions included Louis Bamberger, Jerome T. Congleton, Felix Fuld, Jacob Haussling, and Edward Weston. The third and largest club to emerge from this period was the Newark Athletic Club (NAC), founded in 1919. At its peak, it boasted of 3,800 members which dwindled to less than 300 by 1938. 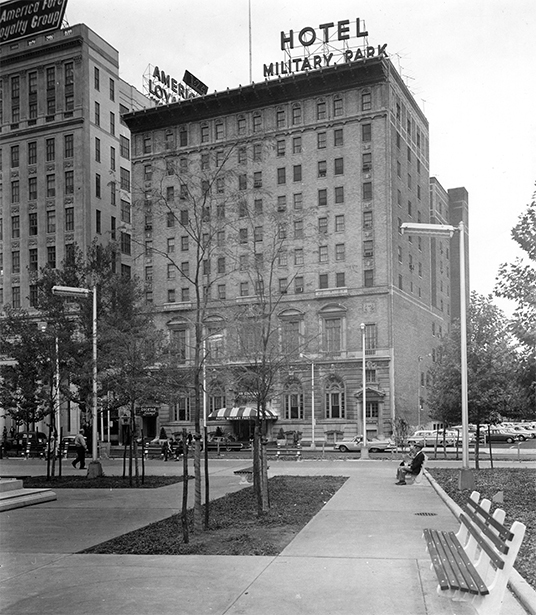 The club's original headquarters, later the Military Park Hotel, was recently demolished and is the site of the new New Jersey Performing Arts Center. The original idea for the club came from former Congressman E.W. Gary and former Gov. Franklin Murphy. Construction of the NAC began in 1921, and the doors opened in 1923 with Gen. George Pershing presiding at the ceremonies. According to the Newark News account, the club 'immediately leaped to a position nationally known among organizations of its kind. Athletes bearing the NAC emblem won cups and medals in meets all over the country.' As in the case of the Elks Club on Lincoln Park, the Newark Athletic Club boasted an elaborate sports emporium with a large swimming pool, gymnasium, bowling alley, billiard room, etc. But financial problems resulted in the club's demise for the same reasons as its downtown counterpart, the Elks Club. Thus, it, too, closed. As America and Newark began to change because of wars, depressions and general unrest, many of the city's traditional agencies reflected the differences. New organizations, new people, and new moods were on the horizon.